2nd Mar 2006 Despite the best efforts of Cape Verde Airlines, the crew of five over three days, finally made it to Mindelo to provision the 46 ft Bavaria yacht, which will be home for the next 4 weeks. Weighing anchor at 11am on Wed 25th we choose a route to the north of Sao Vicente intent on making Tarrafel on Sao Nicolau. The skipper Joe Aston soon had the measure of sailing RV Adrianne and we made swift progress past Saint Luzia, Branco and Raso making Tarrafel at 21:00 , where a single dolphin surfaced on the bow in the dark as one had done three years ago. 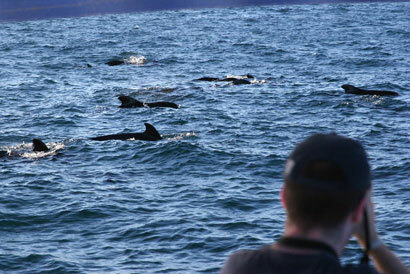 Immediately on leaving the anchorage on Sunday morning Padraig saw blows in the near distance and we had a lovely encounter with around 30-50 short-finned pilot whales and a dozen bottlenose dolphins. Some of the whales had very distinctive dorsal fins including damage probably caused by a propeller of fishing nets. We also obtained 15 minutes of some lovely clicks and whistle as well as dolphin barks and other strange vocalisations. We took the first plankton sample which was nearly the last as the line holding the net at a depth of 40m broke lose from Simon's hand but with quick reactions, he jumped in after it and managed to grab the line as it sunk below the surface. The sample, notably opaque against the bright sunshine, with a thousand small phyto- and zoo-plankton, made the early swim worthwhile. The passage to Boavista was uneventful, RV Adrianne making swift progress across the deep canyon between the islands. The occasional Cape Verde Shearwater, Gadfly and Maderian Petrels and Brown Boobys providing brief company. We made the anchorage at 1am as the bright lights of new holiday complexes on the island shone brightly across the bay.